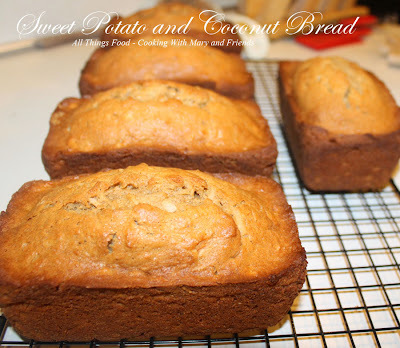 Fresh Sweet Potatoes from our Kitchen Garden were baked and mashed for this Sweet Potato and Coconut Bread! I make them in mini-loaf pans, wrap and freeze for use later! So simple to have in the freezer, grab one or two out when you need them. They are very moist and delicious. GREAT for gift giving at the holidays. 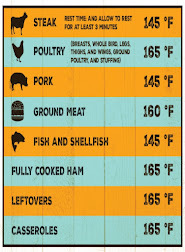 Preheat oven to 350 degrees F (175 degrees C). Grease a 10-inch tube pan or two 9x5 pans or 5 mini-loaf pans (I made this in mini-loaf pans). Mix flour, baking powder, baking soda, cinnamon, nutmeg, and salt in a bowl. Beat butter in a large bowl using an electric mixer until creamy, about 2 minutes. Gradually beat sugar into creamed butter until fully incorporated, about 3 more minutes. Add eggs, 1 at a time, beating each egg completely before add the next. Beat in sweet potato and vanilla extract until well mixed. Stir flour mixture, coconut, and walnuts into butter mixture until just combined. Pour batter into the prepared pans. 1 hour 10 minutes (for tube pan), 1 hour for 9x5 pans and 35-45 minutes for mini-loaf pans.